Double Ended (DE) HPS grow lights are typically used by commercial indoor growers with large spaces and high ceilings. 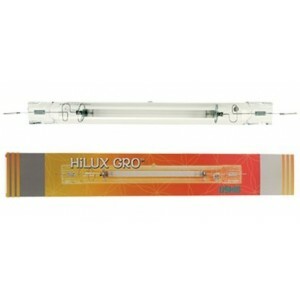 DE HPS grow lights produce higher intensity light due to the design, construction, and internal pressure of the arc tube. The physical design and shape of the DE grow bulb provides a consistent positioning of the light source so reflectors can optimize the focus and footprint of light over the canopy of your plants. 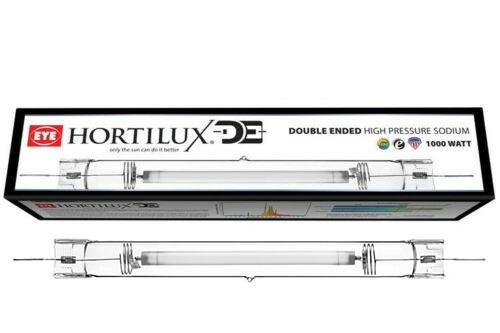 EYE HORTILUX DE HPS lamps have been life tested for thousands of hours to ensure you are receiving a quality and reliable lamp that will operate with consistent performance on the most popular DE electronic ballasts. EYE HORTILUX DE lamps are the only DE lamps made in the USA. 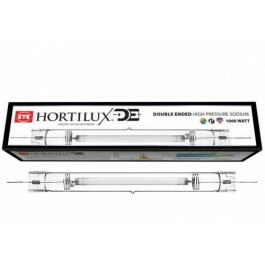 EYE HORTILUX Double Ended (DE) High Pressure Sodium grow lamps offer a reliable light source capable of producing consistently high yields through many growth cycles. The exclusive EYE HORTILUX DE spectrum provides 1950 μmol of photosynthetic photon flux (PPF) when operated at 1000w and 2100 μmol when operated at 1150w. PAR μmol are measured between 400 and 700 nanometers. PLEASE READ DIRECTIONS BEFORE INSTALLING YOUR NEW EYE HORTILUX DE HPS. Over driving the lamp can cause a rapid drop in intensity over time and/or premature lamp failure.